MPR: Shooting victim: "I never thought he would do this"
Shooting victim: "I never thought he would do this"
A victim of Monday's shooting on the Red Lake Indian Reservation gave a first-hand account of the ordeal Thursday. Sophomore Cody Thunder says he had no idea Jeff Weise posed a threat until the 16-year-old opened fire at Red Lake High School. It was part of a shooting spree that left 10 dead, including the assailant. Bemidji, Minn. — Cody Thunder, 15, says he immediately recognized the sound of gunfire when schoolmate Jeff Weise began shooting. Even so, Thunder says he couldn't believe what he was seeing when, moments later, Weise peered through a window into the biology classroom at Thunder and more than a dozen other students. "I was in shock, and I didn't think that he -- I was, like, what is he doing? And then he ended up shooting," said Thunder. "I thought he was messing around. I thought it was a paintball gun or something. He had a mean face." A bullet hit Thunder in the right hip -- it remains lodged in the muscle. He spoke from a wheelchair at North Country Regional Hospital, where two other victims are also receiving treatment. All three are in fair condition and are expected to make full recoveries. Two other victims were taken to MeritCare Hospital in Fargo. One is in serious condition, the other, critical. Thunder says he knew Weise from several classes they shared a year ago. And he says he had made several attempts to befriend him. "He looked like a cool guy. And then I went and talked to him a few times. And he talked about nothing but guns and shooting people," said Thunder. Thunder says Weise's school notebooks contained Nazi imagery. And he said Weise cultivated a dangerous appearance, including sculpting his hair to look as if he had devil horns: "It looked like he was trying to be evil." He looked like a cool guy, and then I talked to him a few times. He talked about guns and shooting people. But he says the drawings and the talk of guns never indicated that Weise would turn on his fellow students. "I never thought he would do this. I never thought that he'd come up and try to shoot up the school," he said. Asked about returning to school, Thunder said: "I don't feel like going back." Later, he declared he wouldn't return this school year. 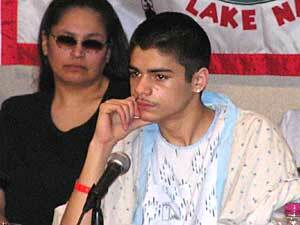 Thunder was joined at the news conference by Lance Crowe, 15, who sustained a gunshot wound to the left hand. Crowe chose not to speak or take questions. Crowe, a basketball player, may have survived by playing dead after he was shot, relatives have said. Ryan Auginash, 14, is recovering from a shot to the chest and was unable to attend. His mother spoke on his behalf. And an uncle, Darryl Auginash, admonished reporters for some of the questions they asked during the press conference. "It's hard on these kids. You know, and sometimes you guys ask questions that try to lead them on. Don't do that to them. They're hurting enough," Auginash said. Later in the day, hospital officials declared the grounds a press-free zone, asking reporters to leave the building and not to approach visitors in the parking lot. Meanwhile, the three teenage patients met privately with one of the few who can comprehend their experience. Lauren Bohn of Hutchinson, Minnesota, was a freshman at Colorado's Columbine High School six years ago, during the nation's deadliest school shooting yet. Bohn says news of the Red Lake tragedy instantly brought back her own memories -- and she says she felt an immediate need to travel to Red Lake and offer her assistance. "Some are going to react with anger. Some are going to be emotional with crying. My words of encouragement to them is, talk about it," Bohn said. "Whether it's counselors or parents or teachers, surround yourself with people who have been through the situation. Consistently be in prayer for them. It could be a long road; it could be a short road. Each person's going to handle it different." Bohn says the victims are surprisingly strong, given the circumstances. She's also had a chance to meet with the faculty and staff at Red Lake High School, and to attend a larger community service on the reservation. Bohn joined a gathering of high school students Thursday. It was the first time the student body had been assembled since the shooting. Bohn says the most difficult challenge will be making students feel safe about returning to school. Red Lake Superintendent Stuart Desjarlait says officials had thought the school was safe, prior to this week's tragedy. "It goes to show that if something's going to happen, it's going to happen," Desjarlait said. "No matter what you do, no matter where you are, no matter what precautions you take, something like this can happen." Desjarlait says the school will remain closed at least until the middle of April, but teachers and staff met with students Thursday afternoon. Thursday's meeting at the high school wasn't open to the media, but reporters were allowed a brief look from the outside. Along a chain-link fence, well-wishers had threaded roses and silk flowers, including some in the shape of a cross. Some messages memorialized victims by name; one read, in part, "Red Lake, our prayers are with you in heart and spirit." Wanda Baxter, a teacher at both the middle school and high school, estimated 200 to 300 students and teachers were there. Baxter said a tribal elder addressed the crowd in Ojibwe, encouraging them to support each other. "What made me cry was when one of our elder women got up and spoke," Baxter said. "She didn't cry, but seeing her pain is what got me emotional." Wakes began Thursday for some of the shooting victims, with the first funerals scheduled for Saturday. Gov. Tim Pawlenty was scheduled to attend a joint service that day in Red Lake for Daryl Lussier, Weise's grandfather, and his companion, Michelle Sigana.